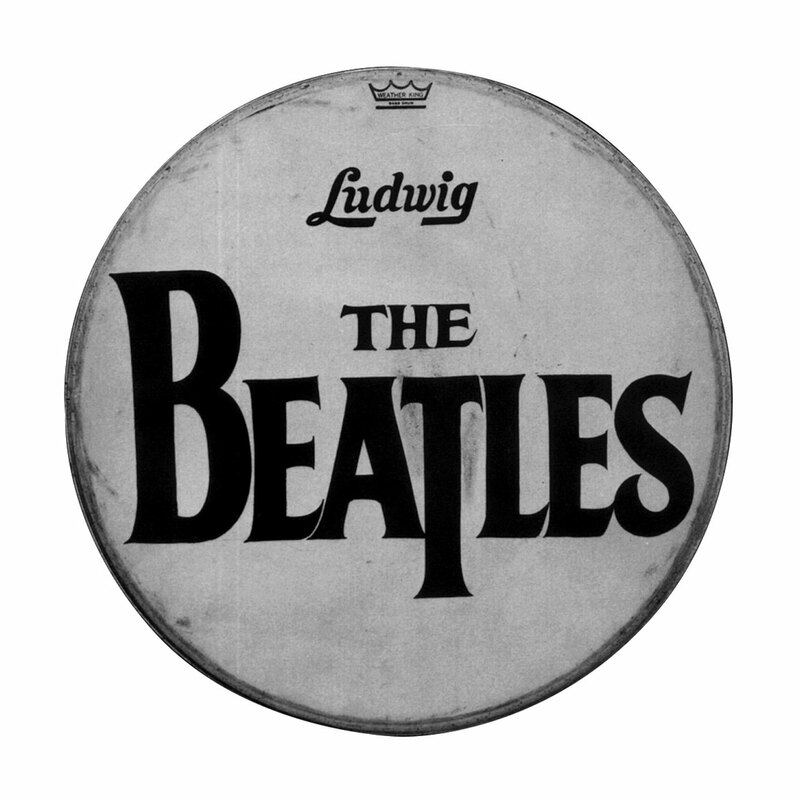 Beatles Drumhead - The most expensive drumhead in the world! 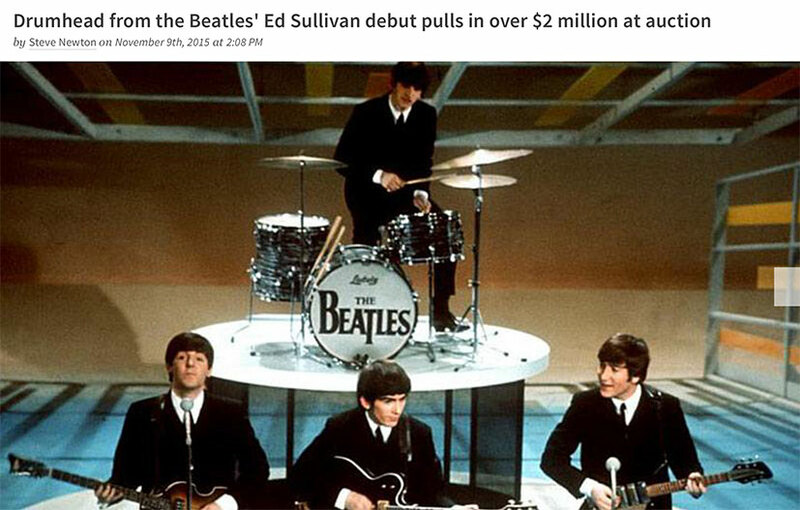 On November 7, 2015, the drumhead from the Beatles' Ed Sullivan debut was sold at Julien's auction in Beverly Hills, CA, for $2.125 million. It was purchased by Indianapolis Colts owner, Jim Irsay, to be added to his collection of rare guitars and collectibles in Indianapolis, Indiana. This Remo Drumhead with the Beatles' logo has now become the most expensive drumhead in the world! It is worth so much that Remo Belli said, "We couldn't even afford to buy our drumhead back!" This most significant logo drumhead is a 20" bass drumhead made by Remo, Inc. and was originally seen on Ringo Starr's Ludwig kit on the Ed Sullivan Show on February 9, 1964. It was used for the duration of the Beatles' first American tour including all three Ed Sullivan appearances, a concert at Washington Coliseum and two shows at New York City's Carnegie Hall and was featured on the album covers The Beatles Second Album and Something New. It was only 7 years prior to 1964 when Remo Belli created the first successful Mylar® drumhead, Weatherking®. Before 1957 drummers were playing on animal skin drumheads. The Weatherking® drumhead offered greater versatility for drummers with its resistance to weather, making it easier to tune and stay in tune. Ringo Starr has been using Remo drumheads ever since that first appearance on the Ed Sullivan Show. February 9, 1964, the first time we saw that iconic drumhead, was an historical night that changed lives and music, as we knew it. There were so many school-aged kids who were influenced by the Beatles' performance that night that are now musicians, particularly drummers. Russ Lease, the previous owner of the famous drumhead, said, "…that was the night I became a drummer. Maybe not in talent, at the tender age of seven, but certainly in mind and spirit. After the Beatles' American tour, the drumhead was kept at Abbey Road Studios, London, until it was auctioned by Sotheby's in 1984 and sold to an Australian restaurateur named George Wilkins for just under $9,000. Wilkins re-consigned it to Sotheby's in 1994 when it was sold to Russ Lease, one of four members in Fab Four Exhibits, LLC, a group who pooled their Beatles' collectables and partnered with the Grammy Museum to create a traveling exhibit. Now the Beatles' logo drumhead can be seen by invitation-only in Jim Irsay's office and secret memorabilia room inside the Indianapolis Colt's Headquarters.